This article deals with the information that can be drawn from historical written sources regarding food in a special geographic area and time period. Sweden stands as an example and the time period is the seventeenth century when Sweden started to raise to power in the Baltic area. The main source that has been used is the printed cookbooks that have been left behind from the 17th century in the Swedish language but also books about housekeeping and economy. Let’s start with wine; one of the earliest written sources there is in Sweden concerning wine is Olaus Magnus work about the Northern People, written and published in the 16th century. According to Olaus the wine should have a certain amount of smokiness, not too much or too little but just right. Even so, a sweet one was the wine that pleased the taste the best and a dry wine gave the least heat. A white wine should be yellowish to the color while the red wine should tender to be pale to its color. Even so a red wine with a nice read color strengthens the stomach among others. However the color should not turn into brown or even darker since that kind of wine was looked upon as viscous and troubled the head to a larger extent than the other red wines. One should always pay attention to the wines age, should not be too young or old. If one considered all this while choosing the wine one got the best wine that had a delightful taste, just the right amount of maturity and a delicious color. All the good qualities of the wine could be straightened by adding cherries, white mustard and different kind of flowers. Here one should keep in mind that Sweden did not produce wine so wine was imported and was expensive. The wine that came from the Greek island Candia was known as “Malvesir” and strengthen the stomach and the heart. From the same island and other wine yards came wines that was called “Muskatell” and was the finest wine there was to be found. Wine from Hungary was considered to be very strong and harsh to its character and the drinker experienced a hot sensation when the wine found its way to the head. Spain exported wine to Sweden that the suede’s preferred to use as medicine rather then to drink as wine. The Spanish wines came from Catalonia and were called “Alicante wines”: Other wines from Spain were called vino secco (dry wine) and were used as medicine for bleeding gastric ulcer. Wines from the Rhen valley in Germany strengthen the heart if it was consumed in moderate quantities but if it was drunk in large quantities the effect was the opposite, then one suffered from gout, kidney-and gallstones. The wines from France were many and come from different part of the country and they where considered to be weaker in general then the wines from Greece, Spain, Hungary and Germany. Beer was a very important daily beverage for everyone, regardless of social class since the access to pure water was limited. There is no certain number on the quantities that was drunk on a daily basis but several accounts let us know that the consumption was between three-four liters per day. 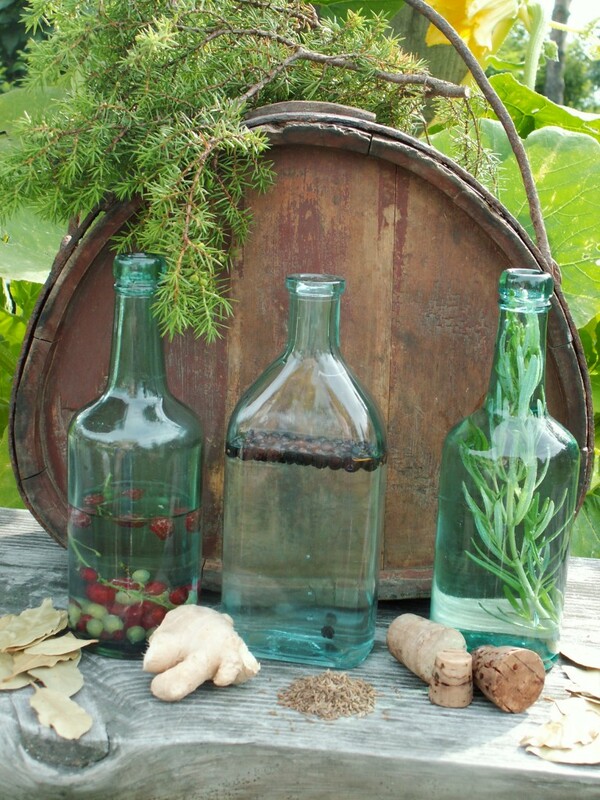 The costume of adding flavors was also practiced on beer; one favorite was to add wormwood (a century later it was very popular to add wormwood to the schnapps) and it was considered to help the liver, spleen, head each, sleep deprivation and jaundice. Blackthorn was another favorite and was considered to help against dysentery and as an excellent cooler on hot summer days. Rosemary on the other hand gave air in the stomach for more food, in general strengthen the body and the heart. If one was stricken by general disease weakness it was highly recommended to dip a piece of bread into the beer flavored with rosemary, wait a while until the beer ran it coarse and then one felt normal again. There is a special category of books preserved that is only about how to carve different foodstuffs both at the table in front of the guests and as decoration on the table. The persons working with this was very skilled and it took years of training before one was allowed into a dinner or banquet to work. The first thing that was checked before one was allowed into the hall were the guest were seated was if ones hands and nails was clean. If they were not one was not allowed into the hall and work. Once one was let in one was not allowed to talk to the guest unless spoken to. One had its own set of knifes and worked at certain tables in the banquet hall. One of the working tasks was to create water animals from the peel of lime and citrus. Once they were done they were put on ice to get cold and then placed in the drinking vessels or jars, and once the beverage (mainly wine) was served they were floating. A 17th century person in Sweden would not understand the concept of salad that are in use today since a salad in the 17th century was eaten warm and had little resemblance to the cold salad of cucumbers, tomatoes, unions and lettuce of today. Some examples of salads from the time period are carrots and beets that was boiled until they were soft and then peeled, cut into slices and placed on a plate. Olive oil and vinegar was pored over and black pepper sprinkled over it just before serving. Turkish beans or and sugar beets was boiled in water and left to cool off and oil, vinegar was pored over before they were served. Different kind of lettuces was also parboiled, left to cool off and cut in smaller pieces and marinated in oil and vinegar. Green herbs of various kinds was popular to cut in smaller pieces and sprinkled over the dishes before they were presented to the guests. Examples of the main ingredients for some of the vegetarian dishes during the 17th century in Sweden, it is important to keep in mind here that potato was not eaten during this time so root vegetables was important. On the left there is different kind of onions that was fried in butter and spiced with black and white pepper along with sugar. 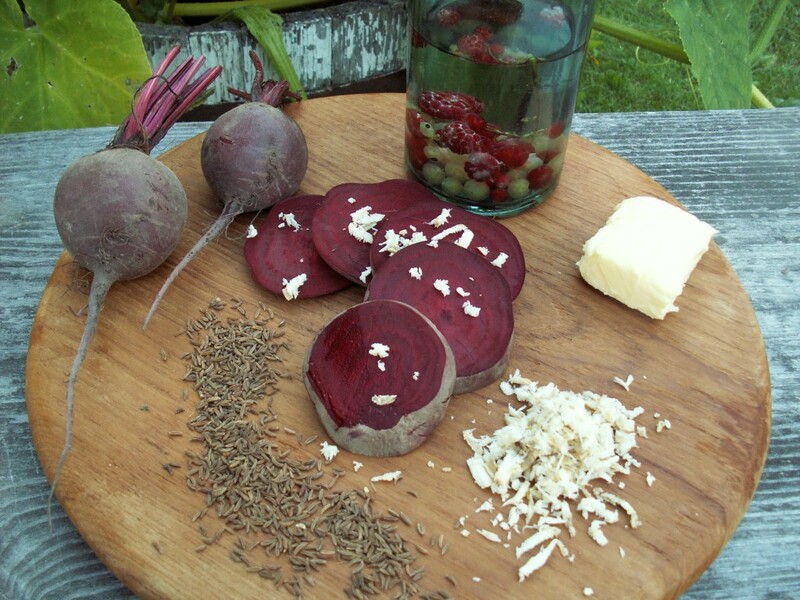 On the right is beetroots that was freid in butter and seasoned with caraway and fresh horseradish. Even if schnapps was not drunken very often sometimes it was serves with this kind of vegetable dishes. Shellfish was not very common to eat during the 17th century in Sweden, however there are recipes of that category, today it is common to eat crayfish cold, not so during the 17th century, if one eat them, they were always warm. Along with crayfish there are recipes of shrimps, oysters and clams, always eaten warm, the ousters was also eaten smoked. Fish was more frequent then shellfish and it is numerous of species that was eaten and it was very common to use domestic fruits and berries along with different kind of fishes. Fish was boiled, fried, deep fried and smoked. 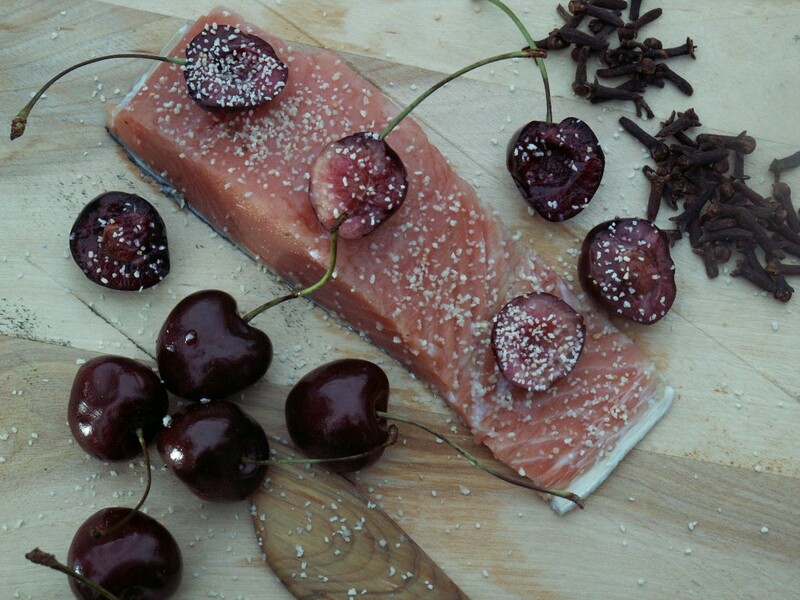 In Sweden it was very common to use domestic fruits and berries when one eat fish, here is one example, fried salmon with a sauce made of cherry and clove. The most common meat in Sweden during the period was pig, followed by beef and sheep. Everything was taken care of from the animal and very little was left over, therefore one finds recipes on sausages and pates for example. One of the more existing recipes is of meatballs. As far as I know it is the first know recipe of meatballs in Sweden, however it differs from the kind that is so well known today. Today Swedish meatballs are fried in a pan. During the 17th century minced meat was stuffed into intestines made into balls and softly boiled. 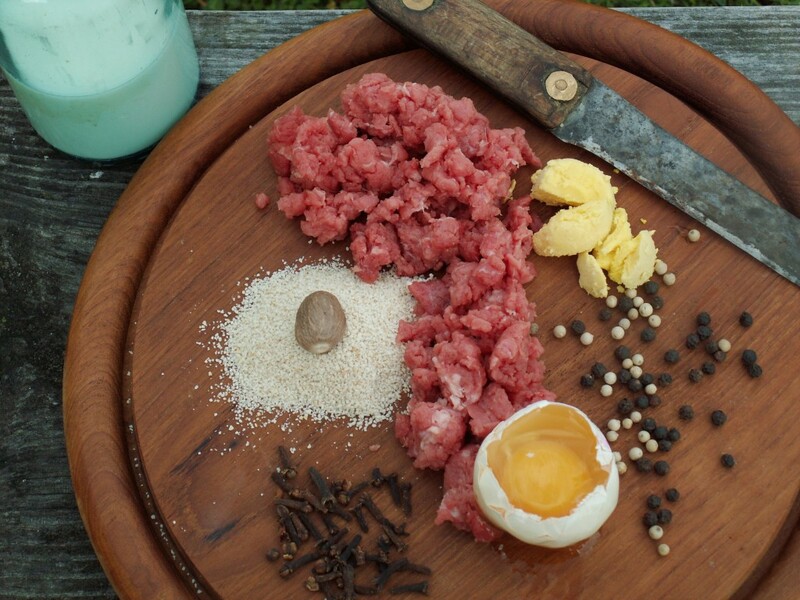 The ingredients of meatballs in Sweden from the 17th century, minced meat, that should be shopped so thin like paper, nutmeg, milk, egg, black and white pepper, cloves and crumps of bread. Hens and chicken are the common birds even if there is some recipes of birds of prey. After slaughter as much as possible was taken care of therefore one finds recipes like how to prepare the cockscomb and palate. One recipe that is striking is the one of hen and rice. Rice was imported and expensive. One of the more striking recipes is the one of hen and rice. Rice was imported and expensive; however the recipe also contains imported spices such as cinnamon and raisins along with the domestic gooseberry. A sauce was made from the gooseberries while the imported spices were added to the rice in the end of the boiling. Products such as dairy and eggs where side products of having domesticated animals and they were frequently used both in pastries but also in dishes such as different kind of dishes such as omelets. For example cheese omelets but also for deserts omelets such as gooseberry omelets. They were also used as main ingredients for waffles and pancakes. Pancakes and waffles was and still is cheap and filling dishes. For the pastry section most of the recipes are creations of high quality and that took a lot of time to prepare and make. There are recipes of cakes that are fired, deep fried, baked in the oven such as different kinds of doughnuts with different fillings, sponge cakes and so forth. If waffles and pancakes where the cookies named “nuns” where the opposite, highly expensive. Ingredients for the cookies called ”nuns”. The dough was made of wheat flour, butter, sugar, egg, sweet almond, saffron and mace. After the cookies had been cut out they were deep fried. As I myself have training at culinary schools and have experience from the industry it is striking that what the modern man apprehend as something new and modern in fact has been around before, one example is what Rålamb did back in the 17th century when he spoke of limited and balanced flavor’s, that one should be careful with not letting on flavor take over the others. Rålambs salads are a very good example of it. What also is very striking is how wine was described; it is more or less the same words that the sommeliers are using today. Some of the dishes that can be found in the material such as pancakes, waffles, steaks doughnuts are still around in Sweden while others has been forgotten such as the pastry called “nuns”, a highly expensive pastry indeed. Even if the results in the text do not derive from archaeological sources and that the written records are limited it is my opinion that one as a researcher should not distances oneself from a material that can be hard to work with. Since I usually work interdisciplinary I think a project like this one, where only written sources are used can lay the foundation for what one can expect to find at archaeological sites that dates from the same period. In Sweden it is not very common to excavate sites from the 17th century and specially not restaurants or inns, however I hope that this will change in the future and that researcher will start to understand the importance of the heritage food and beverage leaves behind. Söderlind, Ulrica, Stormatstiden, Stockholm, 2008.